It is not often that all the elements for a photo come together. As we hiked up to Spirit Lake the wind was blowing and thick clouds covered the mountains with their shade. It looked like I might not need to take out my camera this evening.Then, about an hour before sunset the clouds began to part making way for the light of the setting sun and the winds died allowing the water to resume its peaceful stillness. That evening was one I will remember for a very long time. 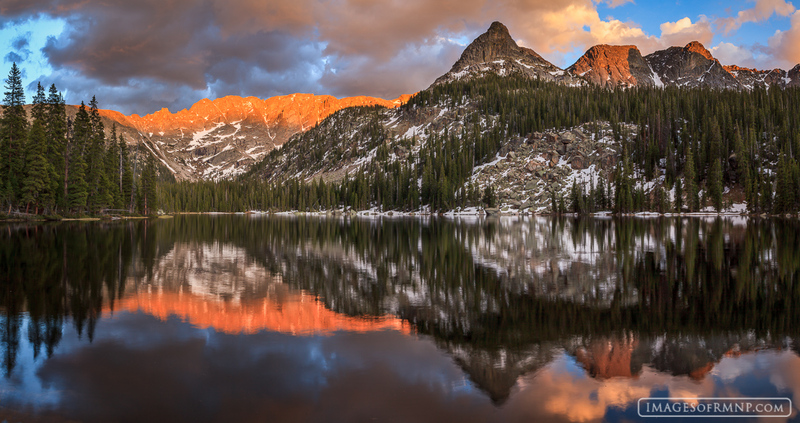 The mountains and remaining clouds above them lit on fire and reflected on the still water. The sunset lasted longer than any I have seen for a long time and so I was able to make this photo which is a composite of six images which allows it to be printed at very large sizes. Photo © copyright by Erik Stensland.